WTware configurator. Terminal configuration files management, WTware utilities and WTware services. 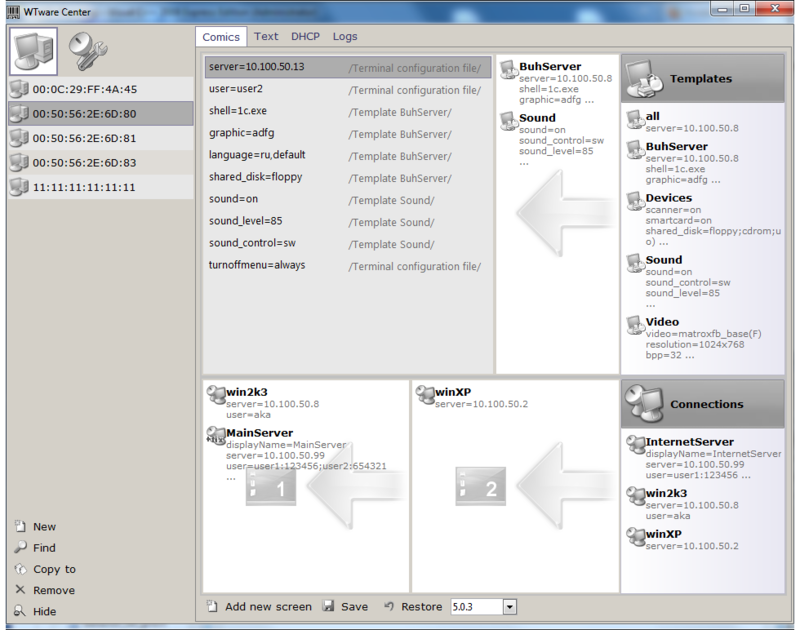 WTware configurator is a graphical interface for terminal configuration files management and changing terminal settings. One program now contains all WTware utilities, WTware services management, terminal and services logging. In many configurator windows (when changing terminals configuration, editing configuration parameters or adding new terminal) you see list of WTware versions. Versions list contains all installed on this computer and supported by configurator versions. Sometimes it's neccessary to boot different terminals with different WTware versions. If you use our DHCP-server — WTDHCP service — it tells terminal to boot with specified in configurator version. Also from version to version list of configuration file parameters may change or their possible values may alter. Configurator controls validity of specified parameters and values, just select WTware version for terminal. If "No version" selected, terminal boots with current WTware version (or with version specified in settings of another DHCP-server, not WTDHCP, if you use one). Terminals, configuration parameters, terminal connections and terminal templates, that are incompatible with specified terminal version, configurator marks with sign. Templates and connections from lists of all included files, that are incompatible with current WTware version, configurator also marks with sign. Terminals list contains MAC-addresses (also hostnames if possible) of сomputers that can work as WTware terminals. Terminal is added to this list automatically when configurator receives message from any WTware service: "I see terminal with such MAC-address and such IP-address". 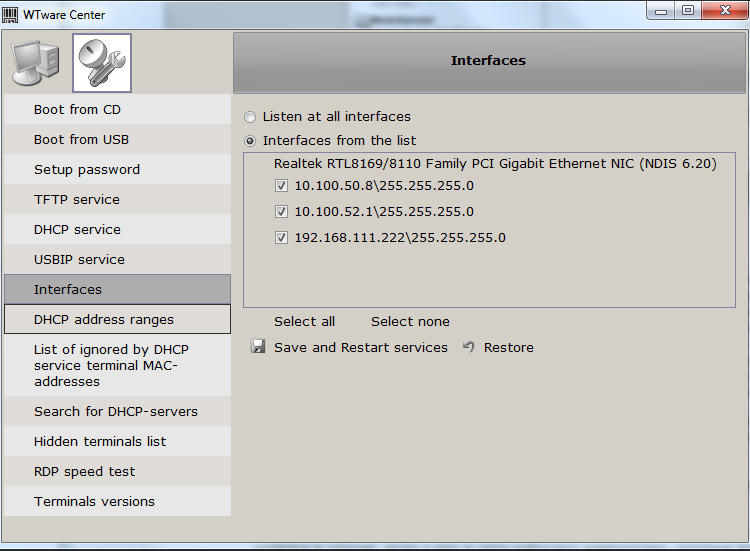 Also you can add terminal with known MAC-address manually. "New" — manually create new terminal with known parameters: MAC-address, IP-address, hostname, version. MAC-address is required parameter. "Find" — find terminal with known parameters. "Copy to" — copy configuration file of selected terminal to another terminal. "Remove" — remove selected terminal. "Hide" — hide selected terminal from terminals list. It's useful when there's some computers in network that shouldn't be used as terminals. If you remove such terminal from the list WTware service possibly will add it later again when detects some activity. How to edit list of hidden terminals see section "Utilities"
You can edit configuration file in two ways — in graphical form (section "Comics") and as text file (section "Text"). Templates and connections — included files (include parameter in previous versions). You can make a set of included files typical for your network settings. Then it will take minimum time to add new terminal. Templates contain terminal parameters. In order to add template to configuration file of selected terminal drag it from list of all templates and drop it to terminal templates area. After dropping you'll see that contents of "Terminal parameters" list changed. Final parameter value, that will be used by terminal, depends on terminal templates order. When one parameter has different values in different templates, value from the last included template will be used in terminal configuration. Try to change templates order in terminal templates list. And see that result value will change in terminal parameters list. Template all — special reserved template, it's automatically included into all terminals. On list of all templates allowed operations: add template, edit template parameters (see parameters editor), remove template. On list of terminal templates allowed operations: view template parameters, change templates order and remove from list. Connections contain limited list of parameters, because not all values can be determined after terminal boot. For example video settings terminal should know before it starts to boot. But server name, user name and what disks should be redirected may differ in different connections. On list of all connections allowed such operations: add connection, edit connection parameters (see parameters editor), remove connection. For more details on how to use connections see section "Terminal screens". as default parameter value. This value is not shown in terminal parameters list. You can see it in parameters editor window. You can add new configuration file parameter, edit selected or remove selected parameter from terminal configuration file. If parameter is removed from configuration file, parameter result value for terminal is determined from included templates, template all or as default value. You can add, remove screens, change their order. One screen exists always. Screen contents is determined by set of connections with terminal servers. If there's more than one connection on screen, then you'll see menu for selecting connection on terminal. Connection parameter displayName lets you specify any name to display connection in this menu. Connections order on screen in configurator affects only order of displaying connections in this menu. Connection can be dragged to screen from all connections list or added manually. You can edit screen connection parameters using the same parameters editor as while editing terminal parameters. But set of parameters will differ — most parameters should be determined before terminal boots and can't change later. When you changed and save connection, its icon changes to sign. Press "Save" and your configuration file is ready. If terminal configuration file is incompatible with selected WTware version, then configurator marks terminal in terminals list, incorrect parameters and\or incorrect included files by sign . And before parameters editor start configurator will suggest to fix errors. View and edit configuration file in text form. Configuration file changes in text and graphics are synchronized. Press button "Test text" to check, whether entered in text field text file is correct configuration file and is compatible with selected WTware version. At start configurator reads and checks all configuration files from data directory for correctness. Sometimes it failes to read configuration file even without version. For example in text file specified more than 4 screens (line next screen in configuration file adds new screen) or parameter name contains non-valid letters. 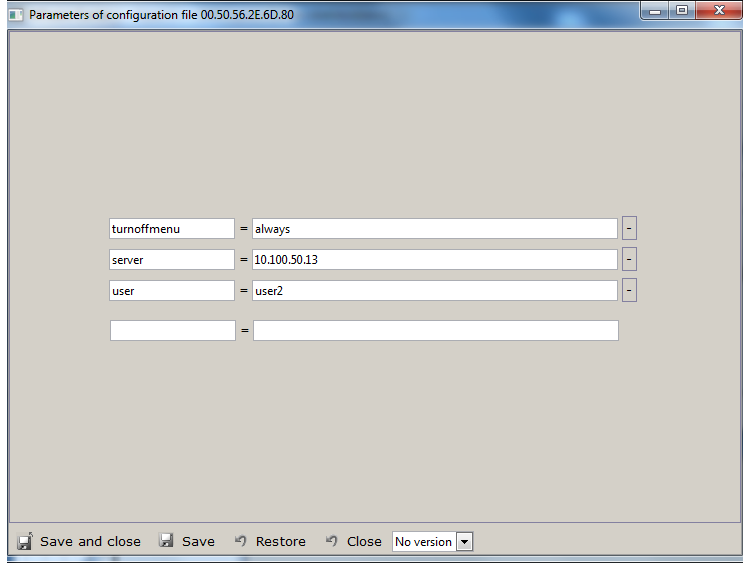 Then configurator renames such file to config.wtc.broken, adds line with error description at file start. Corresponding terminal becomes terminal without configuration. For your convenience we show contents of such broken-file in section "Text" when found. So you can fix it and save correct terminal configuration file. Otherwise you can edit configuration file manually in data directory, where you specified to save data during WTware installation. In our case it's directory "C:\users\all users\WTware\Terminals\MA.CA.DD.RE.SS.00". 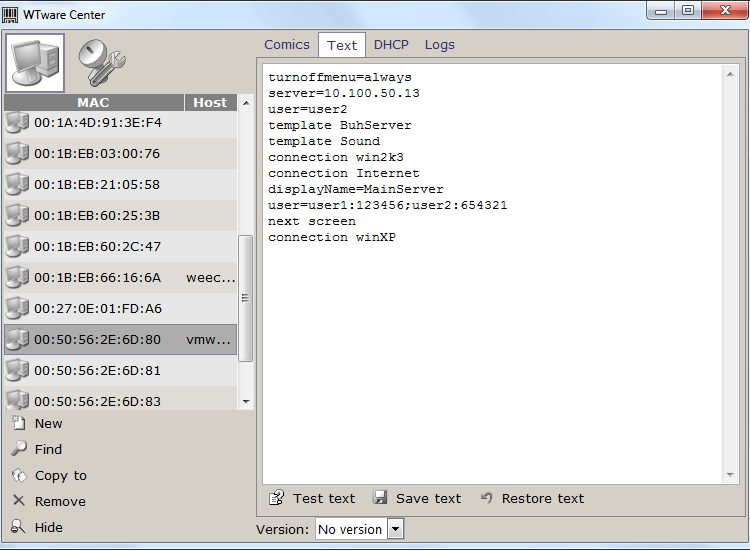 In new version we released WTDHCP service — our DHCP-server. In this section you can specify DHCP parameters for this terminal. Also you can manually set static terminal IP. "Default parameters" are values that WTDHCP service uses for all terminals by default. "Interfaces" and "DHCP address ranges" — shortcuts to useful for WTDHCP service utilities. Terminal logs are messages from services, from configurator, errors — all we need to solve problems with terminal work. Also you can restart and shutdown terminal remotely. Utility "Boot from CD" makes boot CD image to boot WTware terminal from compact-disk. More details in manual "Boot from CD"
Utility "Boot from USB" makes USB-disk to boot WTware terminal from USB. More details in manual "Boot from USB". "Setup password". If you are not brave enough to use our WTDHCP service and want to specify 018 DHCP parameter manually, just copy password hash value. In terminal DHCP parameters (section "DHCP") this password hash you can specify directly in 018 parameter. More details in manual "Setup password". TFTP, DHCP, USBIP services — services management, services logging. Utility "Interfaces" — select interfaces of this computer where services will listen and send replies by network. Utility "DHCP address ranges" — specify ranges from subnets of selected in previous utility interfaces. From these ranges DHCP-server — WTDHCP service — will choose free IP-address for new terminal. Utility "List of ignored by DHCP service terminal MAC-addresses" — specify list of terminals, which requests will be ignored by WTware DHCP service. Use this utility if there's another DHCP-server to serve these terminals and give them IP-addresses. After saving list restart WTDHCP service to apply changes. 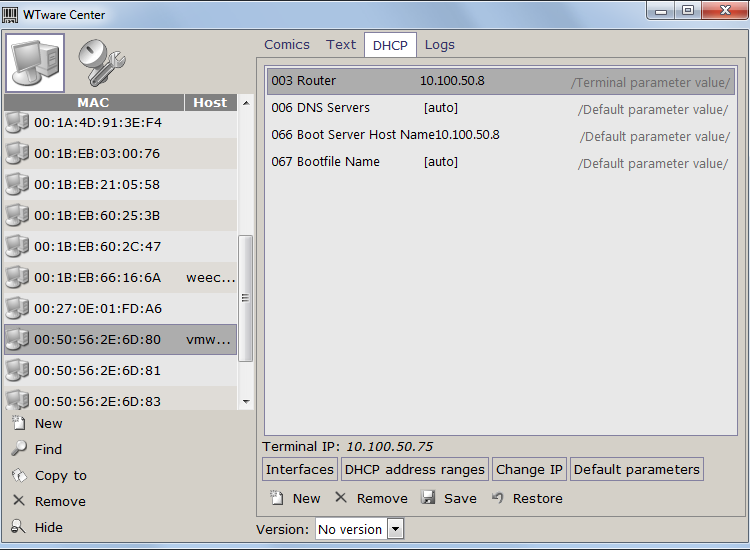 Utility "Search for DHCP-servers". To work correctly there should be only one DHCP-server in subnetwork. 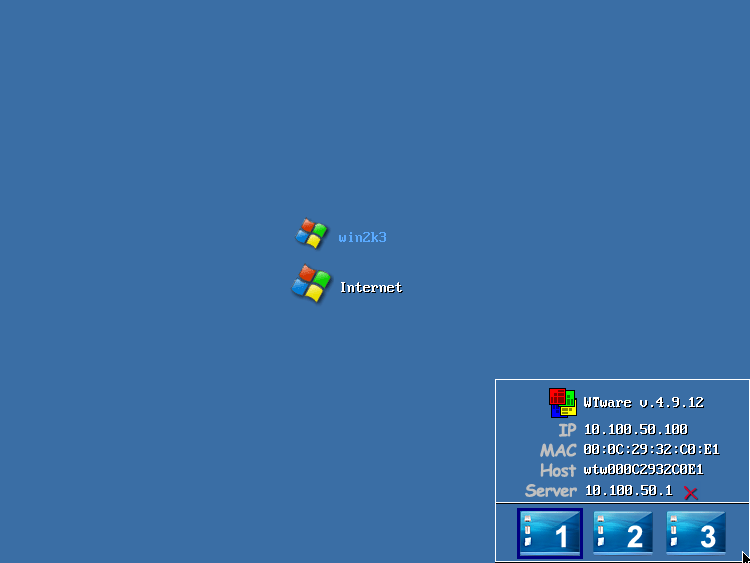 Two DHCP-servers may conflict. If there's no neccessity in found DHCP-servers (for example they are in hardware routers, WiFi access points etc.) stop them. Utility "Hidden terminals list" — manage list of terminals, hidden from main terminals list. Utility "RDP speed test" — measure speed of data transfer between terminal and server by RDP. It takes about 1 minute. Utility "Terminals versions" — change versions of your terminals easy. Found an error? Report us. If it's terminal error select terminal from list > section "Logs" > "Start log" > "Save log". If it's service error select "Utilities" > "... service" > "Start log" > "Save log". Create archive containing data directory. In our case it's "C:\users\all users\WTware\"
Send all this data — screenshot, terminal and\or services logs, data directory — and some words about this error to WTware techsupport. If you have any comments or remarks to this article, please, let us know! !